The most popular version of the dish is made with grated raw potato, cooked mashed potato, and flour, made into a batter with fresh milk and slow cooked in a pan until golden brown. Traditional alternatives include boiled and baked. Grated raw potato, cooked mash and flour, kneaded into dumplings, simmered for 12 minutes, chilled and sauteed in a little butter. Grate the raw potatoes into a muslin cloth and squeeze as much liquid as possible into a bowl. Let liquid stand for 20 minutes. Gently pour off the liquid and keep the starch that settled in the bottom of the bowl. Add grated potatoes to mashed potatoes and flour. Add starch and salt to mix. Slowly add 3/4 milk to form a batter of pouring consistency. Depending on the potato, you may not need to use all the milk. If the batter is too heavy, add more milk. Leave batter resting for 30 minutes. Drop a ladle full onto an oiled non-stick pan over medium heat and cook on the first side for 2 minutes (depends on how heavy the batter is and how much you use). Check color (should be a nice golden color) on the bottom. Adjust heat if necessary. Turn and cook on the other side for 2 – 3 minutes more. 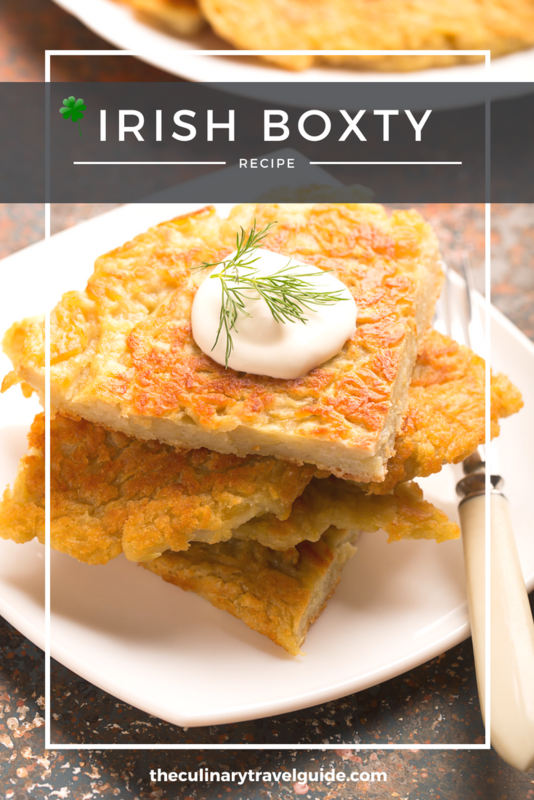 Boxty pancakes are best left overnight in a fridge and reheated in a pan in good butter.